CSKA Moscow struck first in its best-of-five Turkish Airlines Euroleague playoffs series by downing Caja Laboral Vitoria 89-78 in Game 1 on Wednesday. 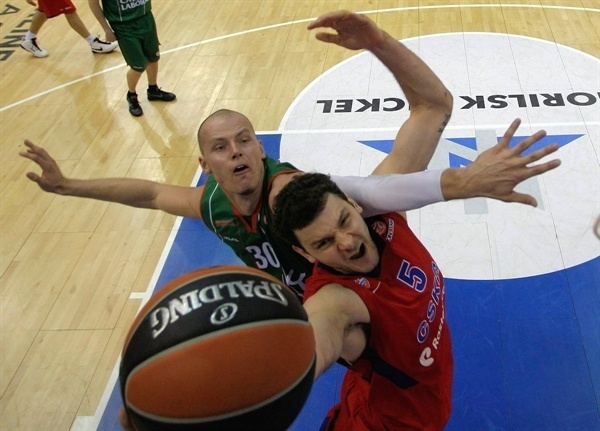 CSKA, which hosts Game 2 on Friday, raised its all-time playoffs home record to 12-1. Laboral can only afford one more loss and will try to avoid a 2-0 deficit, which no team has been able to overcome in Euroleague history. Sonny Weems paced the winners with 19 points. Milos Teodosic added 17, while Nenad Krstic and Sasha Kaun each had 16 for CSKA. 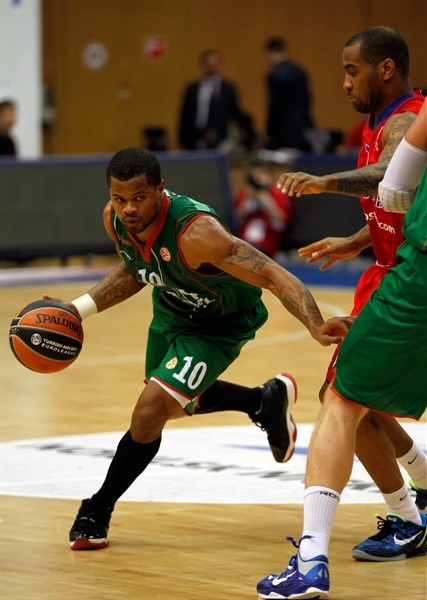 The Russian champs also tied a Euroleague playoffs record with 25 assists as a team. Fabien Causeur led Vitoria with 17 points on 8-of-8 two-point shooting. Andres Nocioni added 16 points and 9 rebounds, Maciej Lampe scored 12 points and Milko Bjelica 10 for the guests. Teodosic shined early as Zoran Erceg and Viktor Khryapa combined for the points in a 7-0 run that gave CSKA a 15-6 margin, enough for the hosts to keep a 26-19 lead after 10 minutes. CSKA found a new go-to guy in Kaun, who got help from Weems and an unstoppable Teodosic to make it 50-35 at halftime. Back-to-back triples by Weems broke the game open right after the break. 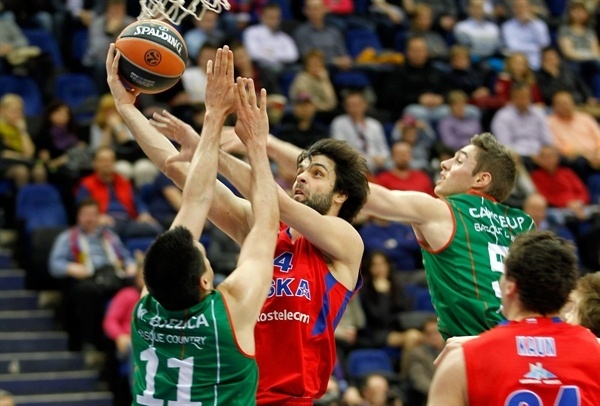 Vitoria kept trying, but CSKA had plenty of time to celebrate a well-deserved win. 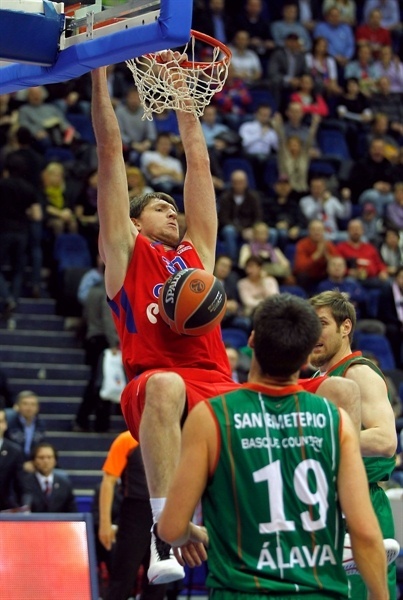 Teodosic got CSKA going with a four-meter jumper and a close basket by Khryapa gave the hosts a 4-0 lead. Lampe shined with a second-chance basket, which Teodosic erased with a driving layup. Nemanja Bjelica hit a mid-range jumper before Weems downed a six-meter shot. A layup by Lampe kept Vitoria within 8-6. Erceg struck from downtown and picked up a great bounce pass from Teodosic to score down low for a 13-6 CSKA margin. A two-handed slam by Khryapa caused Coach Zan Tabak to call timeout at 15-6, after a 7-0 run. Nocioni tried to change things with a put-back layup only to see Khryapa strike from downtown. Lampe and a red-hot Teodosic exchanged layups and a jumper by Causeur kept the guests within 20-12. Kaun split free throws, but CSKA struggled to score late in the first quarter. Meanwhile, Milko Bjelica hit a jump hook and Causeur added a running layup for a 21-16 score. 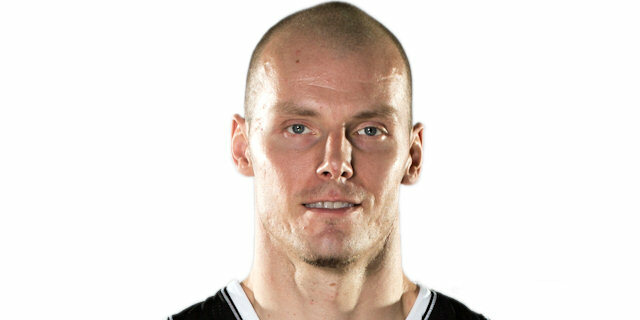 Vladimir Micov stepped up with a three-point play. 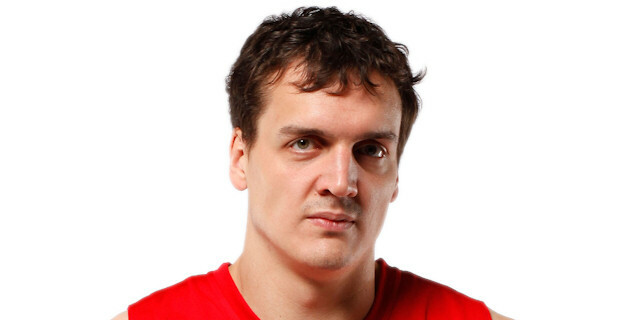 Milko Bjelica nailed one from beyond the arc and a jump hook by Krstic gave CSKA a 26-19 edge after 10 minutes. Krstic kept pacing CSKA and another jump hook early in the second quarter. Causeur matched him with a wild running jumper. 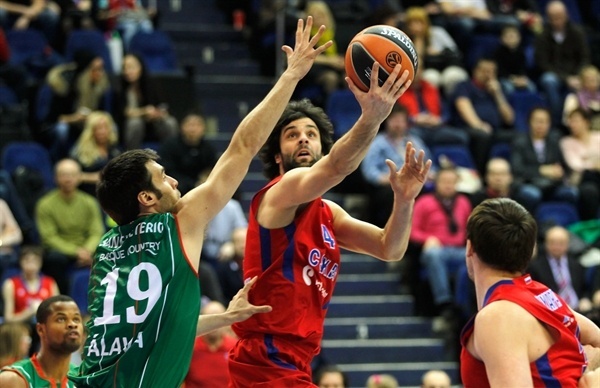 Teodosic took over with a wild three-pointer to restore a double-digit CSKA lead, 31-21. Milko Bjelica split free throws and a three-point play by Causeur gave Vitoria some hope at 31-25. Krstic swished a five-meter jumper and a layup-plus-foul by an outstanding Teodosic kept CSKA way ahead, 36-25. Nocioni finished a three-chance Vitoria offense with a close basket and David Jelinek followed with a fast break slam to get within 7. Kaun dunked in traffic and even after Lampe scored around the basket, Theo Papaloukas found Kaun for another slam. Kaun stayed on fire with a tip-in and free throws for a 44-31 CSKA lead. Vitoria could not find the way to the basket and foul shots by Sonny Weems broke the game open, 46-31. Thomas Heurtel scored in penetration off a timeout but Weems answered from downtown. A layup by Lampe and a free throw by Weems fixed the halftime score at 50-35. Weems buried back-to-back three-pointers right after the break to boost CSKA's lead to 21. Nocioni scored around the basket, but Khryapa ignited the crowd with a slam off a midcourt steal. Causeur banked in a running jumper and free throws by Nocioni brought the guests a bit closer, 58-41. Tibor Pleiss capped a 0-6 run with a dunk, as Coach Ettore Messina brought Papaloukas off the bench to improve his team's ball circulation. Krstic shined with a big basket in the low post and erased Pleiss's high-flying tip-in with free throws. Milko Bjelica hit a floating jump hook in the lane, but Papaloukas found Krstic for a close jumper. Nocioni struck from downtown to get Vitoria within 64-50. Pleiss added an alley-oop layup, which Micov improved on with a three-pointer. Milko Bjelica and Kaun traded dunks and a layup by Nocioni made it a 13-point game. Kaun dunked again and Krstic matched Fernando San Emeterio's layup with a six-meter jumper, good for a 73-58 CSKA lead through three quarters. 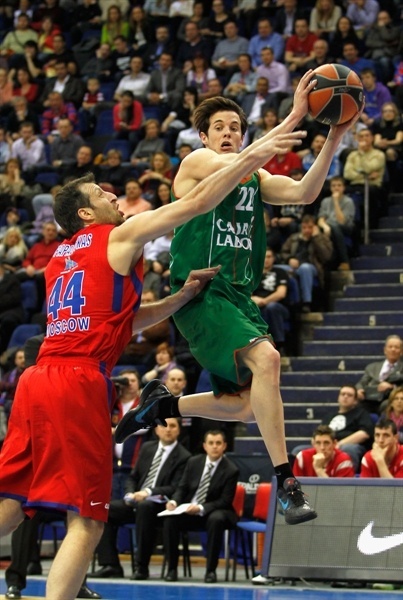 Causeur buried a jumper early in the fourth quarter, but Teodosic beat the buzzer with a catch-and-shoot three-pointer. CSKA had started to use long possessions to run the game clock down and a three-pointer by Weems which sealed the outcome and caused Vitoria stop the game at 79-60. 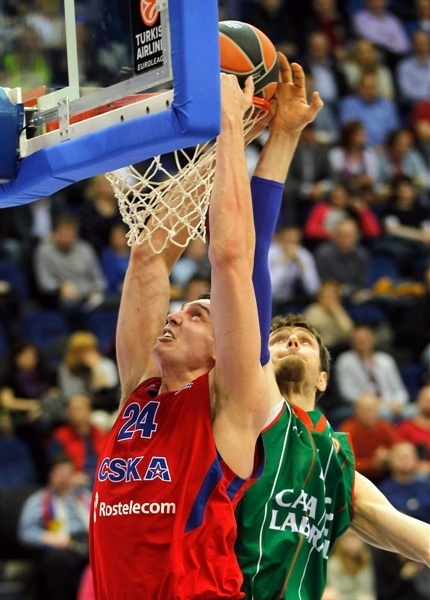 The hosts kept powering the offensive boards and a three-point play by Micov gave CSKA a 22-point lead. Causeur scored again before Krstic shined with a second-chance layup. Causeur kept trying to change things with a driving layup and a slam by Nemanja Bjelica brought the guests a bit closer, 84-66. Lampe scored in transition. After Kaun split free throws, a three-point play by Nocioni brought Vitoria within 85-71 with over three minutes left. Nemanja Bjelica buried a three-pointer, but by the time Weems nailed a wild driving basket, the outcome was clear. CSKA had added its first playoffs win this season. "It was difficult, physical game. I think we played a very good first half. The team efficiency ranking says that we had a lot of great moments. But the opponents showed that they have energy and talent. We allowed 69 percent of two-point shots, which is unacceptable and tells us that we still have to change a lot. At the start of the first half there was a lot of contact and we weren’t calm enough. Still we managed to score when we needed to score and controlled the game until the very end." "We did not play in the way we should have. We knew perfectly what CSKA is capable of doing, how they play on their home court but we did not show the physical level compared to our opponents. We allowed 50 points through the first two quarters, which tells us that we weren’t physical enough. I think some of our players showed too much respect to CSKA and I will do my best to try to change the situation." "In some part of the game we lost concentration, we will try not to do that anymore. The series is short so we can’t allow ourselves to make so many mistakes. In the second game we should improve, continue to play hard and try to win." "We are disappointed, of course. We could play better, but they are bigger and have more experience. We gotta spin it up next game, being more aggressive. Because on the defense we made a lot of mistakes, we were kind of surprised. Now we should put everything in place in the next game."